This site provides the information on activity and main results of the 3D Active-Site Science Project. For further information please follow the links listed in the left menu column. 2019/2/4 Symposium on 3D Active-site Science in London will be held on 4th of February. Special issue of JPSJ related to 3D active-site science was published. It is still on the way. Topics papers will gradually be published. 2017/12/29 News Letter No.8 (Japanese version) has been published. 2018/12/05 Project members issued a press release announcing. 2018/11/30-12/1 3D Active-site Science Sponsored event was held at NAIST. Eight of the new academic area research related to materials science jointly held conference for 2 days at NAIST. 133 participants joined this conference. 2018/11/28Project members issued a press release announcing. 2018/11/27 A study of project members has been highlighted on Advanced Science News. 2018/11/10-11 3D Active-site Science was exhibited Science Agora 2018. 2018/11/2 A study of project members has been published in Materialia. 2018/10/30 A study of project members has been selected as front cover. 雑誌名： ChemCatChem, 2018, 10, 4536-4544. 2018/10/17 A study of project members has been published inJournal of the American Chemical Society . 2018/10/13-14 The 8th Report Meetinge of recent results will be held in Ibaraki Univ. Co-organized by 3D Active Site-Science was held in Hiroshima Univ. 2018/9/22 Project member, Prof. Ohyama gave trial lesson to High school students regarding holography. 2018/9/21 Project member, Prof. Yamamoto's student got Poster award at the Japan Institute of Metals and Materials 2018. 2018/8/26 Project member, Prof. Ohyama's student got Jacek Grochowski Memorial Poster Prize at ECM31. 2018/8/6 A study of project members has been published in Applied Physics Letters. Journal：Appl. Phys. Lett. 112, 131603 (2018). 2018/7/21-22 A public experiment for children was conducted at the Himeji Science Museum. 2018/7/11 A study of project members has been published in Physical Review B.
Journal：Phys. Rev. B 98, 014105 (2018). 2018/6/21 A study of project members has been published in Journal of Applied Physics. And it was selected as Editor’s Pick. 2018/6/12 A study of project members has been published in Thin Solid Films. 2018/6/9-10 "Spring School" sponsored by 3D Active-Site was held at Nara Institute of Science and Technology. "4th Spring School" was held at Nara Institute of Science and Technology(NAIST). There were 40 attendees including the lecturers. Mr.Masato Anada and Mr.Kazuki Nagai, both are from Osaka University, received poster award. 2018/6/10 Site Visit of NAIST was held after "Spring School". Project members visited Prof. Daimon's and Prof. Yamada's laboratory. 2018/5/31 A study of project members has been published in ACS Catalysis . And this award was also introduced in The Chemical Daily on May 29. 2018/5/30 Prof.Mitsudome, a member in this area, received an encouragement award of Green and Sustainable Chemistry. And this award was also introduced in The Chemical Daily on June 8. 2018/4/20 A study of project members has been published in JJAP. To measure the holograms of elements lighter than Ti, we improved a cylindrical-type crystal analyzer and constructed a small C-shaped analyzer. Using the constructed C-shaped analyzer, a Ca Kα hologram of a fluorite single crystal was obtained, from which we reconstructed a clear atomic image. 2018/4/3 A study of project members has been published in The Journal of Physical Chemistry C.
2018/3/13 A study of project members has been published in Physical Review B. Pressure dependences of electric and structural properties were investigated for a topological insulator Ag-doped Bi2Se3. X-ray fluorescence holography determined Ag site in Bi2Se3. This is a joint research between Prof. Kubozono Gr. and Prof. Hayashi Gr. 2018/3/10-11 The 7th Report Meetinge of recent results was held in Hiroshima City Univ. 2017/12/22-23 The Report Meeting of recent results of the open type research groups was held. Journal：Nano Letters, 17, 7533-7538, 2017.
in Review of Scientific Instruments. retarding field analyzer (RFA) for photoelectron holography. 2017/12/1 The study by a project members is published in the Journal of Applied Crystallography. The first direct valence-selective structure determination by X-ray fluorescence holography (XFH) is reported. For this method, we use a resonant-type approach of XFH with incident energies close to the K absorption edge. The experimental results are analyzed by a sparse modelling algorithm in order to reconstruct separate images of YO and Y2O3. 2017/12/7 A study of project members has been published in ACS Omega. and issued a press release. 2017/10/25 The study by a project members is published in The Journal of Physical Chemistry C.
The study is also introduced in Nihon Keizai Shimbun (web) on October 25. Press：Nihon Keizai shimbun Web October 25. 2017/10/23-27 Prof. Nomura gave keynote talks at APO2017 in China. and H2 using TiO2-supported Gold Nanoparticle Catalyst. 2017/10/2-3 The 6th Report Meeting of recent results was held at Lund, Sweden. Prof. Ohoyama (Ibaraki Univ) had a lecture about neutron holography to 38 students of Chuo Senior High School in Omitama, Ibaraki. 2017/9/7 Prof. Daimon gave invited talks at NSRRC in Taiwan. 2017-9/1 Prof. Daimon gave invited talks at Keihanna. 2017/8/19 A paper of members of this project was published in Science Advances. The authors reports novel technique, multiple-wavelength neutron holography developed in J-PARC (Tokai, Ibaraki, Japan), which have drastically enhanced accurasy of reconstracted atomic images, in particular, light elements, such as B, H, Li, F.
At the Himeji Science Museum's "Science stall village" event, a public experiment "Let's see the shape of voice" was conducted. It is an experiment that shows a beautiful interference pattern of waves in the resonance state when placing powder on the board and applying vibration. We held for 2 days at 9: 30-16: 00. There were about 500 people in attendance. 2017/6/28 A paper of a member of this project was published in Physical Review Applied. TItle： Correlation Between High Gas Sensitivity and Dopant Structure in W-doped ZnO Authors：Shun Fukami, Munetaka Taguchi, Yutaka Adachi, Isao Sakaguchi, Ken Watanabe, Toyohiko Kinoshita, Takayuki Muro, Tomohiro Matsushita, Fumihiko Matsui, Hiroshi Daimon and Taku T. Suzuki Journal：PHYS. REV. APPLIED 7, 064029 (2017) pp1-6 HP：https://doi.org/10.1103/PhysRevApplied.7.064029 (abstract) Zinc oxide is a representative material which widely used as solid-state gas sensors. However, the local atomic structure around dopant site and these segregation mechanism is not fully understood. The authors find clear evidence for substitution of segregated W atoms into Zn sites in the subsurface layer by photoelectron diffraction techniques, which drastically improves the sensing response. This surface’s structure-function relationship could tell us about how best to prepare these films for this important gas sensing application. 2017/6/28 A paper of a member of this project was published in ACS Catalysis. The authors reported a new catalyst, silica-supported Rh complex and tertiary amine on the same surface. The co-immobilized tertiary amine significantly accelerated hydrosilylation of olefins catalyzed by the Rh complex. The new catalyst achieved turnover number of approximately 1,900,000. 2017/6/26 A paper of members of this project was published in Angewandte Chemie International Edition. Direct formation of amines from amides through hydrogenation is desirable because amines are important chemical targets found in pharmaceuticals and polymers. However, harsh conditions are required for this conversion. The development of catalysts that allow the amide hydrogenation reaction to be performed under mild conditions is a goal of numerous chemists because it is important for sustainable pharmaceutical production. Our project members, Takato Mitsudome and Jun Yamasaki in Osaka University demonstrate a catalyst that effectively converts amides to amines at low temperature under low hydrogen pressure. Authors: Mitsudome T, Miyagawa K, Maeno Z, Mizugaki T, Jitsukawa K, Yamasaki J, Kitagawa Y, Kaneda K.
2017/6/10 "Spring School" sponsored by 3D Active-Site was held at Tokyo Metropolitan University. "3rd Spring School" was held at Akihabara Campus of Tokyo Metropolitan University. There were 43 attendees including the lecturers. 2017/6/9 Prof. Daimon gave keynote speech at EMNANO 2017 at Fukui. Title:3D Local structure Science of Active-site by Atomic-Resolution Stereography and Holography. 2017/6/7 A paper of a member of this project was published in Physical Review B. 2017/5/8 The study by the members of 3D Active Site Science is published in ACTA MATERIALIA. The study is also introduced in two newspapers, CHUGOKU SHIMBUN newspaper on April 29 and NIKKEI SANGYO SHIMBUN newspaper on May 15. Prof. Hayashi, Prof. Hosokawa (A05 Planned Research Members) and Associate Prof. Happo (A12 Planned Research Member) is published in ACTA MATERIALIA. The study is also introduced in newspapers, CHUGOKU SHIMBUN newspaper on April 29 and NIKKEI SANGYO SHIMBUN newspaper on May 15. The local atomic arrangement near a rare metal atom, Nb, in a beta titanium binary alloy was examined by using X-ray fluorescence holography. 2017/05/01-02 Kick-Off Meeting of Open tupe Research was held in SPring-8. 16 members of Open type Researches discussed with the members of this projects about the research plans. 2017/4/26 News Letter No.7 (Japanese version) has been published. 2017/4/21　A member had a lecture to 26 high school students about holography method. The transition temperature of an atomic-layer superconductor, In/Si(111)-(√7x√3), is reported to be controllable precisely by using magnetic organic molecules. The key of this mechanism is the competition between electron charge and spin in organic molecules, and the direction of the electron orbitals of spins that can be regarded as a hidden degrees of freedom in molecules. 2017/3/29 A paper of our members was published in ACS Nano. Prof. Matsui and Prof Hayashi gave talks in 72th annual meeting of Physical Society of Japan at Osaka as invited speakers. Mr. Anada of Osaka Univ. have won a poster award of Quantum Beam Science Festa 2016 held at Tsukuba. 2017/3/13-15 The users meeting of MAX IV was held in Lund, Sweden. Some of the members attended to the meeting. After the meeting, the members visited MAX IV and discussed with Dr. Christoph Quitmann (Director of MAX IV) and other beamline staff members, especially about the future collaboration and organization of joint workshop held in October. One of the target of “3D-active site project” is to promote international collaborations. We consider that MAX IV, most brilliant synchrotron light source, in Sweden can be a candidate of the oversea basement of our project. For future collaboration between European scientists and Japanese members, we plan to organize the joint workshop in October. On March 13-15, the users meeting of MAX IV was held. Some members of our project attended to the meeting in order to obtain the detailed information and status of MAX IV. The emittance smaller than 1nm・rad is designed, and the facility was opened from June in 2016. Some user’s activities seem to be started. There are two storage rings, with acceleration energy of 1.5 and 3GeV. About 300 participants attended and the satellite workshops for industrial use etc were held. The commissioning of storage rings seems to be well. In the 3GeV ring, storage current up to 200mA was achieved. 24 hours topping up injection is also successful at the storage current of 160mA. The emittance of 340pm・rad was also achieved when the storage current is a few mA. 5 insertion devises has been installed. Single bunch operation of 2.8mA (maximum 8.5mA) was succeeded. For 1.5GeV ring, 135mA topping up operation is possible (maximum 150mA). Two beamlines (nanoMAX and BioMAX) which are hard-x-ray beamlines has started their first user’s beam time. Next proposal will soon be accepted. In the soft-x-ray region, ambient pressure photoemission and RIX beamlines are now in under commissioning. In MAX IV, ~3000 users/ year will visit and ~500 publication is expected. Further ~100 PhD papers will be produced. In the initial stage, the budget for 14 beamlines is approved. Plans of up to 22 beamlines are discussed. The guesthouse with 21rooms will be available in September 2017. The neutron beam facility so called ESS is under construction nearby MAX IV. ESS will start their beamtime in 2023 and the construction will be completed in 2025. After the users meeting, some members of “3D active-site” project (Daimon, Hayashi, Matsui and Kinoshita) visited MAX IV. Members obtained detailed information of some related beamlines at MAX IV and presented status and activities of the project. Especially, the proposal to NanoMAX beamline was discussed. Further, the detailed discussion of the joint workshop held in October was discussed. 2017/1/30 A paper of our members about a collaboration work in this project was published on Organometallics. 2016/12/20-21 Local Functional Properties Emerging at Active Sites on Atomic Layers was held at ISSP. 2016/11/24 A review paper by members of this project was published in Chemistry A European Journal, and selected as Highlight Paper and Frontispiece. 2016/11/7 Members of this project gave invited talks at Taiwan. 2016/11/5-6 We planned Science Agora and joined. 80 visitors came to our booth and enjoyed piling up atomic structure model. 2016/9/17 A Project member made an invited talk at Niigata. A project member, Professor Shinya Hosokawa (Kumamoto University), made an invited talk entitled “Three-dimensional atomic images on multi-component mixtures using synchrotron radiation” in the 77th meeting (13-16 September 2016) of the Japan Society of Applied Physics at Toki Messe, Niigata city, Japan. 2016/9/14 A Project member made an invited talk at Hiroshima. Conference:The Physical Society of Japan autumn meeting 2016. 2016/8/29 Our member's paper was published in J. Am. Chem. Soc. 2016/08/01 Our member, Takato Mitsudome, was promoted from Assistant Professor to Associte Professor of Department of Materials Engineering Science, Graduate School of Engineering Science, Osaka University. 2016/7/26 Our member's paper was published in Journal of Computational Chemistry and its figure was selected as Front Cover. Journal of Computational Chemistry 37, 2140-2145 (2016). The short hydrogen bond between tyrosine Yz and D1-His190 of photosystem II (PSII) is involved in the oxidation of water at the Mn cluster. We investigated the short hydrogen bond, using multicomponent quantum mechanics, where the quantum fluctuation of a hydrogen nucleus was incorporated into electronic structure calculation. Our computation demonstrated that the deuteration for hydrogen in the short hydrogen bond of PSII led to the reduction of the O…N distance. It indicated an inverse Ubbelohde effect typically recognized in strong and symmetric hydrogen-bonding clusters such as FHF– and H­­­­­­3O­2–. The Rashba-Bychkov (RB) effect generates spin-polarized electronic states even in non-magnetic materials, and shows a great potential towards practical application of spintronics. This paper reports the observation of a peculiar RB band, which was not expected so far, originating from the C1h symmetry of the surface. The interfacial atomic structures of AlN thin films on a nonpolar 4H-SiC(11-20) substrate were studied by photoelectron diffraction and spectroscopy. The density of intermixing atomic sites at the interface were reduced by improving the growth conditions by referring to intermixing component information. We revealed the atomic and electronic structures of the 4H-AlN/4H-SiC(11-20) interface on which the channels of trench-structure metal-oxide-semiconductor field-effect transistors are formed. this article is selected as editor's picks! RSI editor's picks. This article has been made free to download for a limited time. 2016/7/1 VUVX 2016 satellite workshop "Local 3D atomic and electronic structure imaging"
Venue: University of Zurich, Irchel campus, Switzerland. The detailed information is available on the web site below. Yusuke Wakabayashi, Daisuke Nakajima, Yuki Ishiguro, Kenta Kimura, Tsuyoshi Kimura, Satoshi Tsutsui, Alfred Q. R. Baron, Kouichi Hayashi, Naohisa Happo, Shinya Hosokawa, Kenji Ohwada, and Satoru Nakatsuji, Phys. Rev. B 93, 245117(2016). 2016/6/6 Our members' paper was issued from Organometallics and selected as Most Read Article（The fourth rank ） in May. 2016/05/28 "Spring School" sponsored by 3D Active-Site was held at Tohoku University. "2nd Spring School" was held at Aobayama Campus of Tohoku University. There were 36 attendees including the lecturers. Please visit the website below for more information. 2016/4 Proceedings of "Element Specific Structure Determination in Materials on Nanometer and Sub-Nanometer Scales using modern X-Ray and Neutron Techniques" are published on ZEITSCHRIFT FÜR PHYSIKALISCHE CHEME. 2016/3/28 Our member's paper was issued from Journal of Applied Physics. 2016/3/21 Our member's paper was issued from Applied Physics Letters. 2016/3/14-15 Our supported event "11th SR Surface Science Research Division & Microscopic/Nano Material Science Group Joint Symposium was held. As for the details, please see the web page below. Supported by Infrared Spectroscopy by Synchrotron Radiation, "3D Active-Site Science"
2016/03/7-9 3rd Report Meeting of Recent Results was held at Nagoya . Please click here for the details of the meeting. 2016/3/1-3/2 Our supported event "Seminar at Insutitute for Protein Research" was held. Please click here to see the poster. 2016/02/15 Our news letter was issued. 2016/2/9 A paper of the collaborative research between our planned research groups was published from Chem. Eur. J. A result of collaborative research between Nano Catalysts Group (Prof. Motokura) and Surface/Interface Holography (Prof. Wakabayashi and Dr. Tajiri) was issued from Chem. Eur. J. Site Visit of laboratories of Tokyo Metropolitan University and Tokyo Institute of Technology was held. After presentations of recent results of groups of the two university, we visit laboratories of Prof. Nomura, Prof. Tsutsui, Pro. Wakabayashi and Prof. Motokura. We also had a Coordination Committee Meeting to discuss the project plans including the 3rd anual report meeting, organization of the next international conference and so on. 2016/1/15 Our co-investigator Dr. Ken Motokura received the prize "The Chemical Society of Japan Award For Young Chemists for 2015". The prize ceremony will be held at the CSJ 96th Annual Meeting at Doshisha University on March 26, 2016. 2016/1/13-17 Our supported event "The Symposium on Surface and Nano Science 2016 (SSNS’16) " was held. Supported by The Surface Science Society of Japan, The Physical Society of Japan, "3D Active-Site Science"
The specially-planned lectures had more than 80 audiances and ended successfully. 2015/12/22 A paper of the collaborative research between our planned research groups was published from ACS Catalysis. 2015/12/14 Our member's paper was published and its press release was issued. 2015/11/28 The lectures at "Spring School" was released at Youtube. 2015/11/27-28 Our supported workshop "The present and future of organic photovoltaics" was held. Click here for the detailed information. Supported by "3D-active Site Science"
2015/11/23-24 Our supported event entitled "A variety of microscopic surface imaging" has been held. Event : The 3rd Meeting of Young Researchers' Society for a Variety of Microscopic Imaging Techniques, The Japanese Society of Microscopy "A variety of microscopic surface imaging"
For the details of the event, please click here. Our member gave an invited speech. Please click here for the details of the lecture on Nov. 23 by Prof. Dr. Walter Kaminsky who has contributed to discover and industrialize metallocene catalyst. 2015/11/14-15 A supported program was attended to the event "Science Agora". The biggest science event “Science Agora” (http://www.jst.go.jp/csc/scienceagora/) sponsored by Japan Science and Technology Agency was held in the Odaiba area of Tokyo and we supported the program sponsored by Protein Data Bank Japan(PDBj). 2015/11/13-15 9th Joint Symposium of the MEXT Projects on Condensed Matter Science was held. 2015/11/12 A member of this project delivered a lecture on holography in Graduate School of Ibaraki University. Prof. Ohoyama (Ibaraki Univ) gave a lecture on neutron holography in graduated school of science and engineering, Ibaraki Univ (Hitachi, Japan). Importance of understanding of local structures, principle of holography and resent results of holography were explained to students of the master course. 2015/11/07 A member gave a lecture on neutron holography in an extramural lecture meeting to th e public. This event was an commemorating lecture meeting of 100th anniversary of the discovery of Bragg reflection. Over 140 people including 14 high school students were present. Four lectures about investigations using X-ray, electrons, positrons and neutrons are presented for high school students and people who are interesting in science. Prof. Ohoyama (Ibaraki Univ. ), a member of this project, gave a lecture on holography and local structures investigations. 2015/11/2-3 Three members gave invited talks in international symposium ISAMMDoF2015 in Kumamoto Univ. "One-step Synthesis of Core-Gold/Shell-Ceria Nanomaterial and Its Catalysis for Highly Selective Semihydrogenation of Alkynes"
Session Title "3D holographic imaging and characterizations of active atomic sites"
2015/09/23 The member has given an invited lecture at "Advances in Polylefins 2015". 2019/09/19 Theory group meeting has been held. There were 16 members attending this meeting. They had active discussions and exchanged information for the purpose of promoting their collaborative researches. 2019/09/19 Theory group meeting has been held at Osaka University Nakanoshima Center. This meeting has been held for three days. There are 105 participants in total including members of 3D active-site science, the advisers, Prof. Tsukada, Prof. Kawai, the study researchers, Prof. Katagiri, and Prof. Kojima and lots of graduate students of the related labs. The following people got the poster prize named "Daimon Prize" among the 63 posters. As the participants has stayed together for three days, they could concentrate to get the information of the studies-in-progress, exchange to each study and discuss the future study plans. Also it must be a good opportunity for the young researcher to get a strong motivation to move forward their study. Grant-in-Aid for Scientific Research on Innovative Areas "3D ACTIVE-SITE SCIENCE"
2015/07/21 Data Analysis Tutrial was held at SPring-8. Contents ： In this tutrial course, lectures of Analysis of fluorescent X-ray holography and Photoelectron Holography were given. 18 researchers held and had active discussions about analysis techniques. This tutorial course will be held frequently on request. 2015/07/13 News Letter No.3 was published. 2015/07/4 Site Visit and Coordination Committee Meeting in Osaka Univ. Site visit of experimental facilities, in particular 3 MV Ultra-High Voltage Electron Microscopy (UHVEM). Coordination Committee Meeting was also held at Osaka Univ. 2015/05/11&12 Coordination Committee Meeting was held in SPring-8. 2015/05/11 Kick-off Meeting of Open Type Research was held in SPring-8. 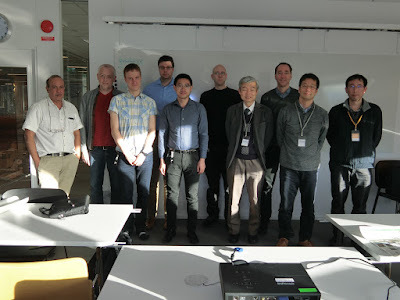 2015/04/26-04/30 International WS"Element Specific Structure Determination in Materials on Nanometer and Sub-Nanometer Scales using modern X-Ray and Neutron Techniques" was held in Germany. "Element Specific Structure Determination in Materials on Nanometer and Sub-Nanometer Scales using modern X-Ray and Neutron Techniques"
The 1st international activity of this project was successfully held. 26 Japanese scientist were held. The 1st Report Meeting of Recent Results was held at IIAS, which is a core facility in Kansai Science City. Poster sessions of all the members of Project, and reports of key results of each planed research groups was held. 2015/03/02 Opening Ceremony of SPring-8 Office of this project has held. Opening Ceremony of SPring-8 Office of this project has held in SPring-8 with 25 attendants. As invited guests, Doi (Director General of JASRI), Noda (Director General of JASRI), Kagoshima (Professor, University of Hyogo), Takada (Manager of the Research & Utilization Division, JASRI) and Ishikawa (Director of RIKEN SPring-8 Center) extended their congratulations to this project.